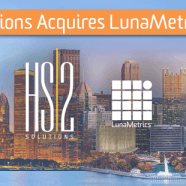 Home » SEO Articles » HS2 Solutions Acquires LunaMetrics! As CEO of LunaMetrics I sign a lot of papers. But on Friday, I signed the most important paper of my career. On Friday morning, I sold LunaMetrics. Though it’s still business as usual, we expect and hope that the boundaries between LunaMetrics and HS2 will become more fluid and eventually disappear. We will welcome some talent from Chicago, and we are excited to be able to provide many more services to our current and future customers! Something as great as HS2 didn’t come to us by accident. We worked with an investment bank to seek out interested parties, and it was exciting to see how our years of experience and success prepared us for this moment. Think speed-dating, but with much higher stakes and much nerdier conversations. I worked closely with Alex Moore and Andrew Garberson to help explore our options. Together and with unanimous support, we chose HS2 because the fit with LunaMetrics was so wonderful. The team here has worked hard and the sales group has sold hard. We’ve grown. We’ve hired and nurtured some of the best talent in Pittsburgh (and beyond!) and our reputation as industry experts has never been more widespread. I really want to take a step back and let the other members of the management team take steps forward. They are talented, eager and looking for that kind of responsibility, and I have been doing the CEO thing for more than a decade. I am thrilled that we found HS2 Solutions. When I decided to sell, I knew that it would only work if we found just the right company. We needed a company that matched us on many levels, from the way we motivate and nurture talent to the way that we value customer service above all else. LunaMetrics shot for the moon and we found the best partner, HS2! Learn more about HS2 Solutions and read their blog or press release. The post HS2 Solutions Acquires LunaMetrics! appeared first on LunaMetrics.